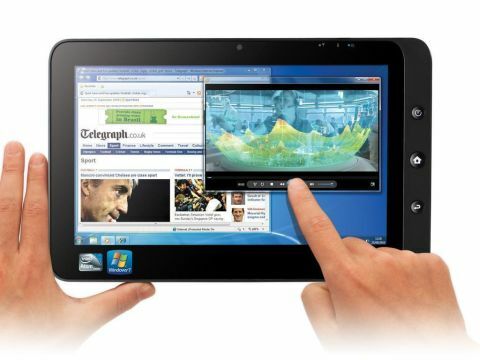 Can a Windows 7 tablet rival the iPad? Windows 7 just isn't right for tablets, making this frustrating to use, despite the price. Apple's iPad was the only tablet on store shelves for the bulk of the year, but now it faces genuine competition from the likes of Samsung's Galaxy Tab. However, most of the contenders we've seen have proved to be cheap imitations, such as the Elonex eTouch 1000ET and the Disgo Tablet 6000. British manufacturer Novatech is the latest company to release its own touch-based device, and first impressions of the Novatech nTablet are favourable. The body feels suitably sturdy, with none of the troublesome flex we saw in the Disgo. An aluminium back resists scratching when the tablet is laid flat and the screen is firm, proving resistive when vigorously prodded. We did notice a little flex along the left edge of the device when it's gripped, which unfortunately cheapens the build, but it's nothing major. Almost all of the tablets we've seen bear more than a passing resemblance to the iPad, and the Novatech nTablet is no exception. The same black border is in place, although the nTablet features a grey appendage on the right edge with three buttons. Bizarrely, this is the exact same design already used by the Viewsonic View Pad. At 890g, the Novatech nTablet is heavier than the iPad, Galaxy Tab and many of the other tablets we've seen lately. The difference is instantly noticeable when holding the nTablet one-handed, and our (admittedly weak) wrists caved in after just a few minutes. Holding the Novatech nTablet two-handed is more comfortable, thanks to that thick black border. The tablet never overheated, even after constant prolonged use, thanks to the vents on the top and bottom of the device. The Novatech nTablet is also quite chunky, with a thickness of 15mm. However, at least the back is flat unlike the curved rear of the iPad, which means the device won't rock when it's laid on a desk and prodded. The £350 asking price (£439 with Windows 7 Home Premium pre-installed) is less than an iPad will set you back, and cheaper than the likes of the Galaxy Tab. The question is, does the nTablet provide as satisfying a user experience, or is it worth throwing down extra cash for Apple or Samsung's tablets?